The 258,000 square foot, nine-story Outpatient Health Center was about six years old. 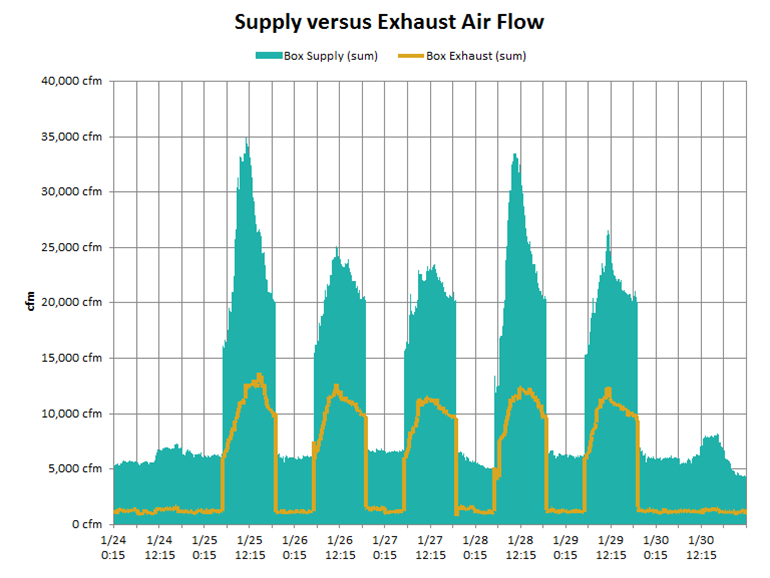 Operations were stable but never achieved the targeted energy utilization index (EUI) expected in the design process. IDS conducted an operational analysis of the facility and identified a major change from design in how the building was used, unaddressed maintenance issues, and significant potential for energy savings. As is common for buildings like this, the majority of the issues were with the building’s automation software. First, a quick summary of the systems. Steam and chilled water are supplied from a central utility plant. The building HVAC consists of four large air handlers ganged into a single plenum serving more than 575 supply/exhaust variable volume with reheat terminal units. Perimeter units have parallel fans. Lighting is controlled by vacancy sensors with a separate set of occupancy contacts feeding the building automation system. The building is occupied 12 hours per day, five days per week. But there was an exception. A pharmacy located in the heart of the building required 24×7 operation. As a result, HVAC operations need to be tailored around its needs. Over 6,000 data points were collected every 15 minutes for the operational analysis. This allowed a 100% review of all equipment in the facility and its performance. The initial analysis found 53 boxes exhibited erratic airflow, 52 were above high temperature set point, nine were not reporting temperature, 39 had inconsistent set points within a common zone, and 27 had their VAV dampers open at 100% while not making flow set point. The building managers had a choice: play whack-a-mole and try to fix one problem after the next and consume extra energy and maintenance resources for years; or, create a remediation plan to bring the building to a more desirable condition. They chose the latter. The work was grouped into three energy conservation measures (ECMs). The remainder of this case study focuses on ECM-1. maintenance improvements that were a symptom of the real problem, which would be fixed with the ECM. The starting point for ECM-1 was to reduce airflow during unoccupied times from the current 100,000 cfm. The chart in Figure 1 shows total airflow of all the VAV boxes in the buildings (summation of trend data from each box). 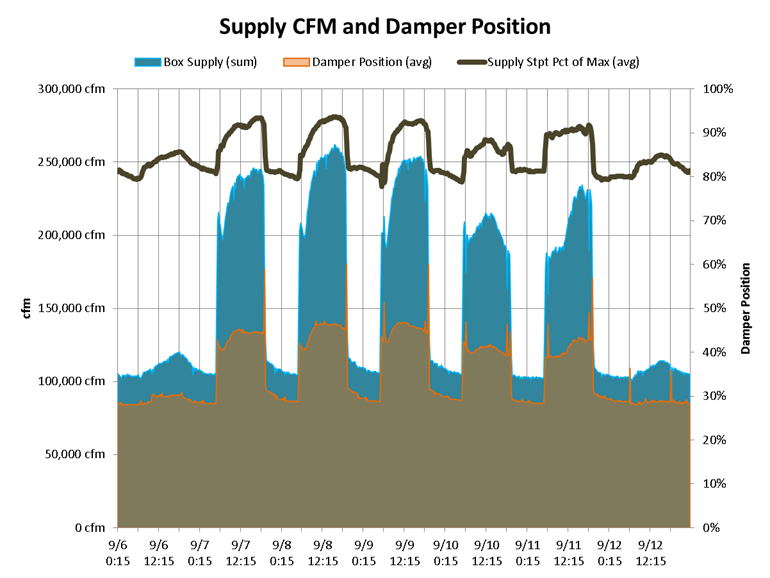 Supply air is averaging a little over 100,000 cfm during unoccupied hours and between 200,000 and 250,000 cfm during occupied time. Actual VAV damper position ranges from approximately 30% to 50%, so there is capacity to increase flow when needed, or reduce static pressure. The final point, Supply Stpt Pct of Max (avg), indicates that the terminal boxes operate at 80% of set point during unoccupied hours and 90-95% of set point during occupancy. Flow stations on the AHU required calibration, but we found access panels had to be cut in order to service them and make necessary repairs. A handful of starved boxes were the result of set points beyond the capacity of the box. These were corrected by establishing the proper limit for max airflow. Some diffuser dampers were closed due to tenant tampering. 27 reheat valves were repaired. Along the way, we found 98 occupancy sensors (of about 700) that were not physically wired or their power supplies had failed. Planned automation code additions to utilize occupancy sensors was found unnecessary. The code existed but was commented out six years prior by the general contractor to expedite construction. 85 units in the building were not restored when the project was ready for occupancy. Once repairs were completed, the next phase of the project was to verify the ECM would operate as needed. We used the seventh floor as a test case. 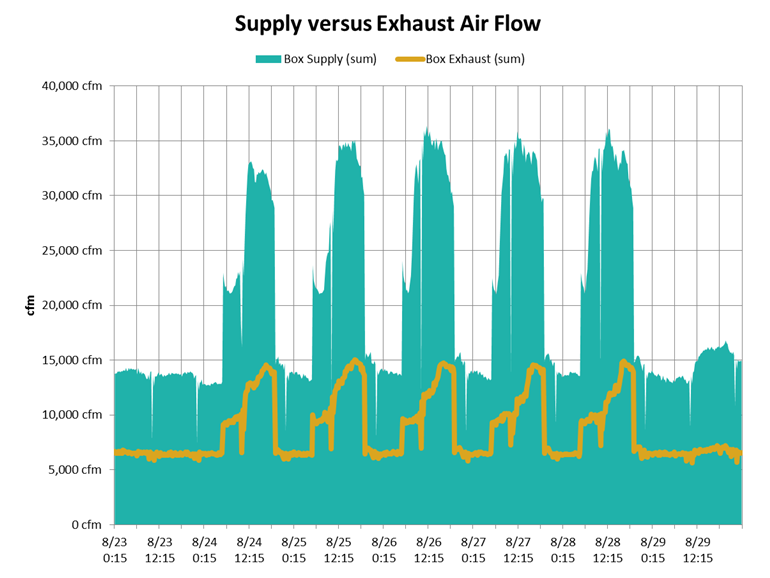 Each box used revised max/min airflows, occupancy sensors were repaired, and the automation code was corrected. The total airflow for the floor was evaluated before and after, as shown in Figures 2 & 3. With all maintenance and repairs completed, and verification of test results on the seventh floor, the project moved toward completion for the rest of the building. One last snag appeared. In order to maintain adequate static pressure and airflow for the Pharmacy, minimum total airflow could not be reduced to the design minimum. Additional boxes were identified to maintain minimum flow that allowed the Pharmacy to be properly supported. 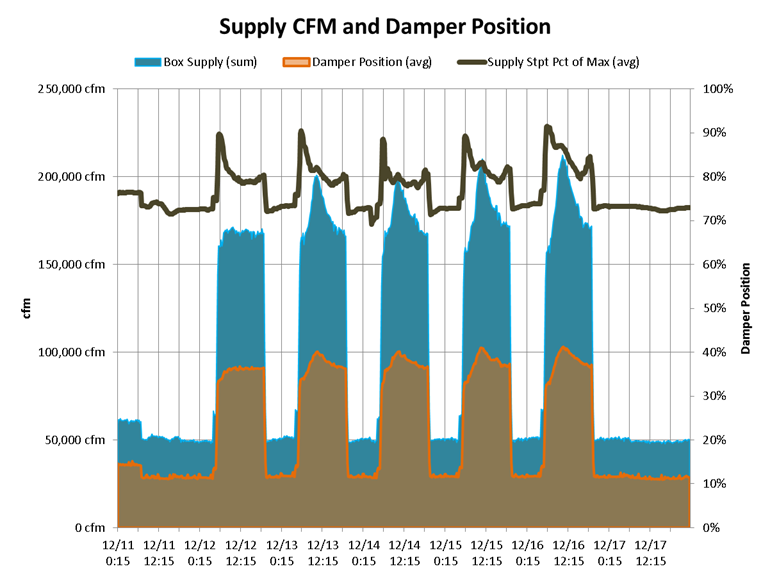 The net result of changes made was a reduction of unoccupied cfm to approximately 50,000 cfm, a 50% decrease in unoccupied airflow, which translates to an EUI reduction of nearly 22 kBtu/ft2. With this stage of the project (ECM-1) complete it was time to move on to redefining occupied airflow. This aspect is covered in Part 2. Copyright © 2017 Interval Data Systems, Inc.